Short films, when they’re done well, can offer a great calling card for directors. Sure, a lot of the shorts that get rushed through in the UK are woeful, too often mistaking shock tactics with saying something clever or interesting. But many British directors including the likes of Shane Meadows and Guy Ritchie cut their teeth on short films, and it’s a pity that more big-screen features in this country aren’t accompanied by a short or two. Final Cut is an organisation that attempts to keep a culture of short films alive, and you can catch their monthly screening sessions at the Hanbury Arms Ballroom in Brighton and Hove. Some of Final Cut’s best shorts can also now be seen in Take Two, their second DVD compilation. The 24 films you’ll find here (which range from 90 seconds to an epic 12 minutes) demonstrate just some of the possibilities that the short movie format can offer. There are few genres that don’t get a look in. And so you’ll find animation (The Devil & Manny Schmeckstein, Doubled Up), experimental dance (Oscar Stringer’s Again and Again – which combines dance moves with the impact of a car crash), micro-scale Hollywood blockbusters (Masato Riesser’s SWAT), music videos (Ben Rollason’s Manifesto) and just all-out strangeness (such as Shane Sheil’s Opera Baby, which can only be described as a Lynch-influenced thumb opera). It’s a great outlet for short movies to actually get seen by the public. Inevitably I didn’t enjoy all the short films on this compilation. But a lot of work has clearly gone into each and every one, and the results do demonstrate some of the potential movie-making talent in this country. Scott Walker’s Ordan’s Forest is an obvious highlight – a genuinely creepy 12 minute fantasy about a little boy exploring an overgrown forest in his sleep. With atmospheric visuals and a sinister synth score, it brings to mind Ridley Scott’s Legend which, of course, is a good thing. Other dramas, like Max Honchrad’s Cost of Living (a technological satire with an effective unsettling ambiance) and Rob Hackett’s Extra Holes (blessed with two great central performances and a nice sense of pacing) also suggest film-makers who may well have a good future ahead of them. I have to admit to being a sucker for animation. 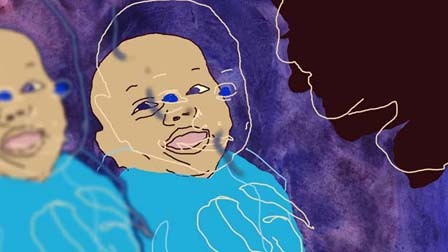 So another high point for me was Samantha Moore’s Doubled Up, a surprisingly sweet film about giving birth to twins where animated line drawings of milk bottles, tricycles and high chairs swirl about the screen while excerpts of a mother finding out that she’s pregnant are played out over the top. Also worth looking out for is The Devil & Manny Schmeckstein from director Jim Goodman, a claymation about a bad comedian sent to hell. It’s a little scrappy round the edges, but this only adds to its charm and it’s bound to appeal to anyone who has childhood memories of Comet Quest. These are just a few of the high points on a DVD crammed with interesting moments. For anyone with an interest in preserving Britain’s tradition of short film making, Final Cut – Take Two is highly recommended.